Fascinated by the beauty of Edo-style woodblock prints, Canadian artist David Bull began carving and printing his own versions of traditional Japanese prints almost 30 years ago, just to please himself. Now living in Japan, Bull is one of a small group of craftsmen working to reproduce Japan's popular ukiyo-e and other woodblock prints. In 1998, the Canadian printmaker completed a set of reproductions of Katsukawa Shunsho's illustrations for the 'Hyakunin lsshu' (One Hundred Poets), which is a collection of 100 poems by different poets. It took him 10 years to complete that project. Since then, Bull has been working to reproduce prints called surimono, forgotten woodblock masterpieces that were privately printed and received only a small circulation among the general public, unlike the more famous ukiyo-e prints. Next week, about 20 of Bull's delicately carved surimono wood-block prints will go on display at his annual exhibition at Gallery Shinjuku Takano in Tokyo's Shinjuku Ward. This show, called 'Surimono Albums' is Bull's second showing of his surimono prints. 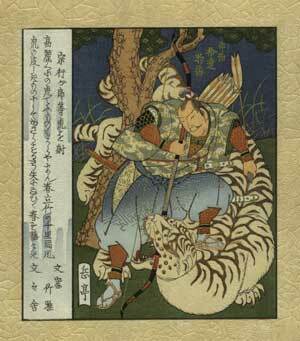 Dating from the 1760s to 1860s, typical surimono style blends an image and poetry in one print. Using fairly simple and straightforward styles, surimono themes included historical events, scenes from kabuki dramas, still-lifes and seasonal landscapes in nature. Bull uses the same traditional techniques that the original craftsmen used, and his show will feature fine carvings and prints, including reproductions of Toyota Hokkei's Spring Fuji, Kitao Shigemasa's Yoshiwara Courtesan, Isoda Koryusai's Peony and Sparrow, Katsushika Hokusai's Soshi the Philosopher, Ando Hiroshige's Evening Rain at Eitai Bridge, Yashima Gakutei's Warrior and Tiger and many more.